Samsung recently announced its financial results for Q3 2017, and Specifically regarding its OLED business, SDC increased its sales of flexible OLEDs, but prices of rigid OLED panels declined. DSCC estimates that the utilization at Samsung's OLED fab fell from mid-80% to mid-70% mostly due to delays in shipments to Apple. The low utilization rate resulted in a decline in OLED operating income, which fell 37% from Q2 2017. 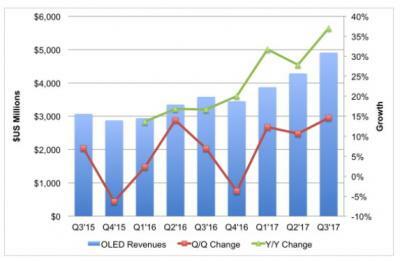 Revenues actually increased (as you can see in the chart above), but pricing pressure on rigid OLED panels meant that SDC's OLED operating margins fell from 22.5% in Q2 2017 to 12.4% in Q3 2017. DSCC estimates however that OLED profitability will rebound quickly as Apple are likely to increase iPhone X shipments and as utilization and yield improve. The higher demand for higher-cost flexible OLEDs are likely to enable SDC to return its operating margin to over 20%.